You know a game is full-on bonkers when even telling someone it combines solitaire and horse racing doesn't convey how bonkers it is. I'm sure some of you are wondering, can a title produced by the folks (at Game Freak) who gave the world the decidedly tame Pokémon series really be all that bonkers? Oh, and last bullet point involves quickly clearing a series of golf solitaire tableaus--which also is pretty bonkers, if you ask me. Of course, none of the wackiness described above means much if the rest of what’s on offer is a bore. Thankfully, it’s not. 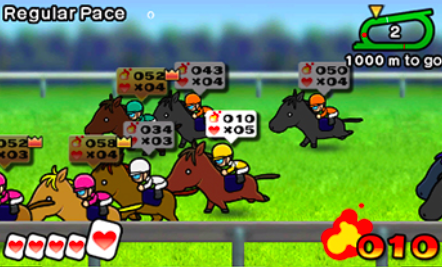 In fact, Pocket Card Jockey is as addictively and delightfully fun as it is brilliantly weird. It’s like Tetris in that it’s the kind of game that prompts you tell yourself, “just one more race. OK, maybe two more.” And the next thing you know, you have no idea where the last couple of hours went. 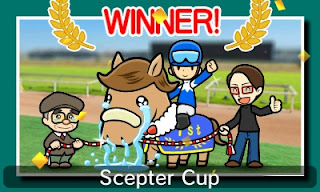 That’s due, in large part, to how adroitly Game Freak's designers were able to turn Pocket Card Jockey's many disparate elements into a bite-sized title that's far more than the sum of its parts. Actually, it goes beyond that. They also were able to combine this game's many components in such a way that you rarely think of them as separate entities. Rather than thinking of this as a solitaire game or a horse-racing or -breeding game, Pocket Card Jockey is very much its own thing--kind of like how the Famicom Disk System title, Otocky, is its own thing despite blending the shmup and rhythm genres. All that said, more than a few of this title's elements deserve to be singled out for praise. One is its overall art style, which is about as adorable and appealing as can be. Another is its control scheme, which relies almost entirely on the 3DS' touch screen--and to great effect. 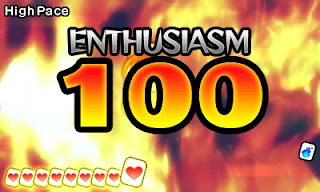 Its localized text, which is both darker and wittier than most will expect from a Game Freak-made release, is similarly on-point. Finally, there's its soundtrack, which may be the best to appear in a 3DS game yet. As for Pocket Card Jockey's negative aspects, I honestly can't think of any at the moment. Some may point to the abundance of text that's offered up here, or the fact that it becomes a tad repetitive over time, but I personally don't consider them to be worthy of complaint. 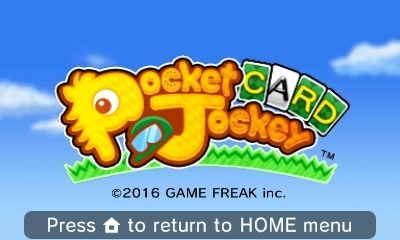 If you absolutely need me to rip on some portion of Pocket Card Jockey, this will have to do: should you be anything like me, you'll put a lot of time into this digital title. Don't believe me? Consider that I spent about 70 hours with the Japanese version of the game and I've spent nearly as many hours with its North American counterpart. In other words, you probably won't regret spending just under $7 on it--unless, I guess, you have an extreme distaste for anything that can be described as "bonkers."